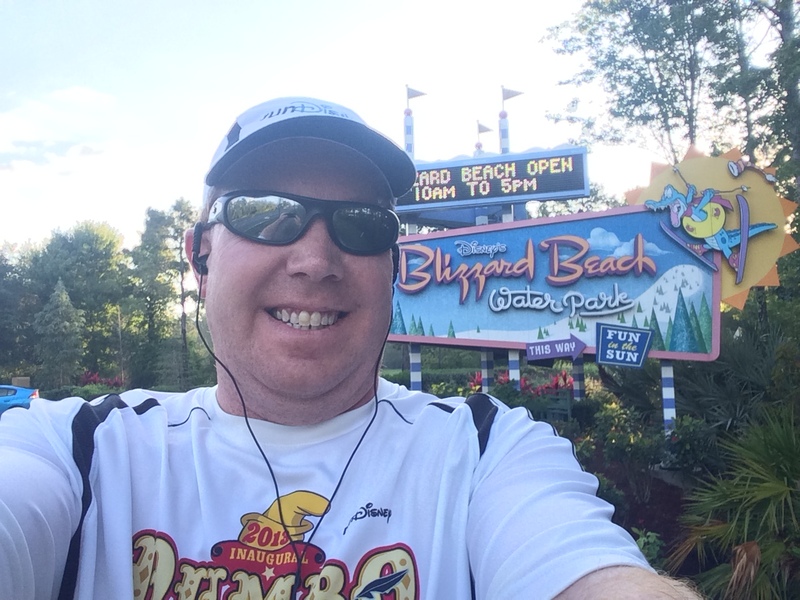 As I mentioned yesterday, I ran 12.5 miles in total while on vacation at Walt Disney World. Before leaving, I looked up the various paths you could run. One of them happened to be at Disney’s All Star Resorts, where I was staying. Now, the path listed was only a mile. I needed 3 for my mid-week runs. So, that meant that I had to improvise. No problem! 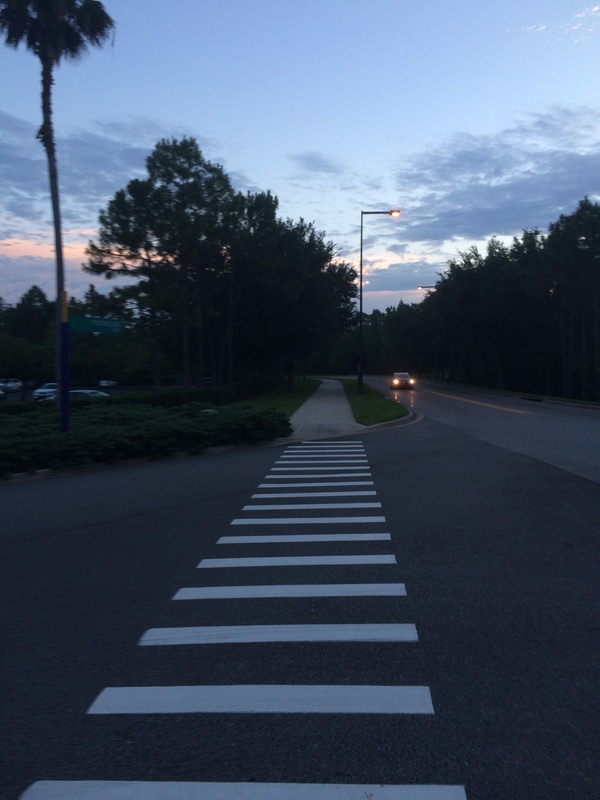 On the first morning, I was up early for my first 3 mile mid-week run. 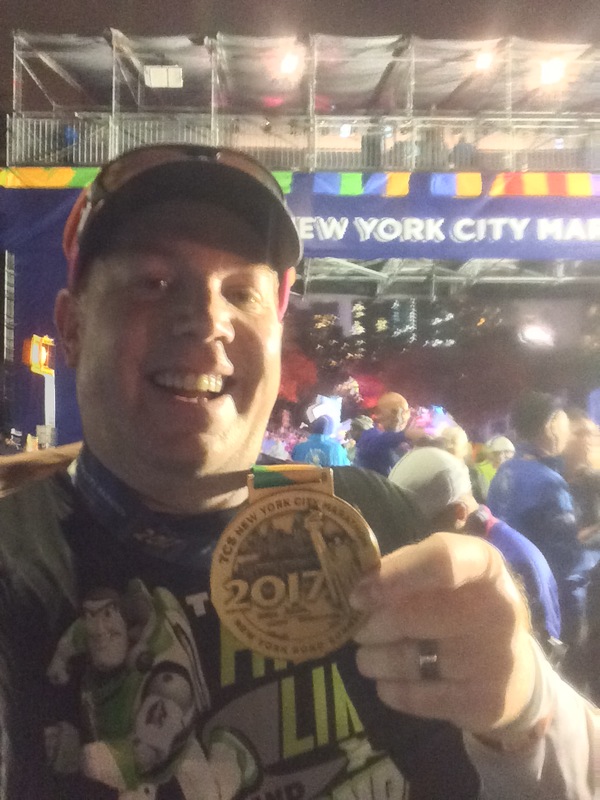 One thing I should mention here is, if you want to run at Walt Disney World, make sure to plan out how to fuel your runs before you go. I didn’t do this so well. Each of my 3 runs involved different plans. For the first run, I opted to only consume water before. It was not the best choice. However, without the comforts of my own apartment, I just kind of went with what I could do. We were going to the Magic Kingdom on this day and I didn’t want to take too much time away from the group. On the way out to start, I saw several others running. The morning felt wonderful! It was cool enough to be enjoyable and not too cold to make me feel like I was freezing. I started where this picture was taken. The plan was to take me all the way from my resort (All Star Movies) to the All Star Sports. I’d check the GPS to see how far that was. Then, I’d improvise. It felt amazing to start running! Seeing new sights was so much fun that I was running longer than I should have in that first mile. It was hard not to get lost in the scenery! This wasn’t running in Pasadena. 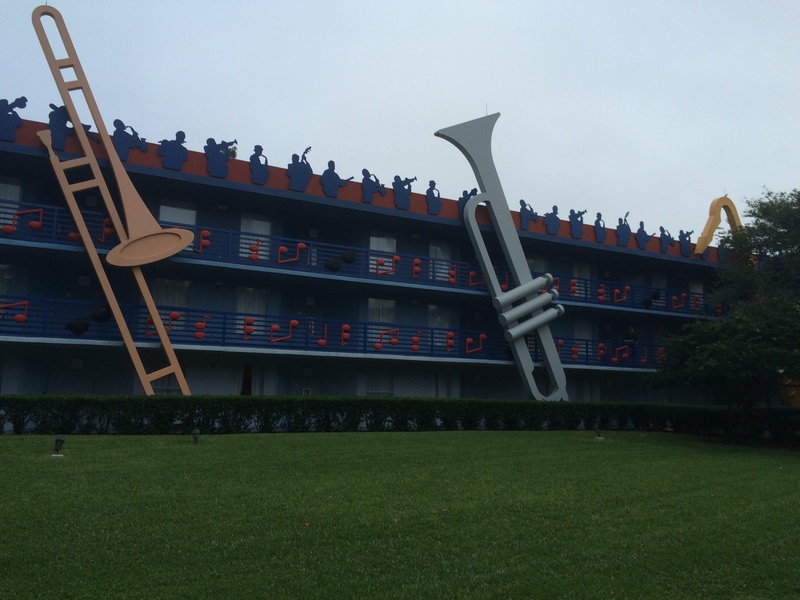 It didn’t take too long to get to the All Stars Music Resort. 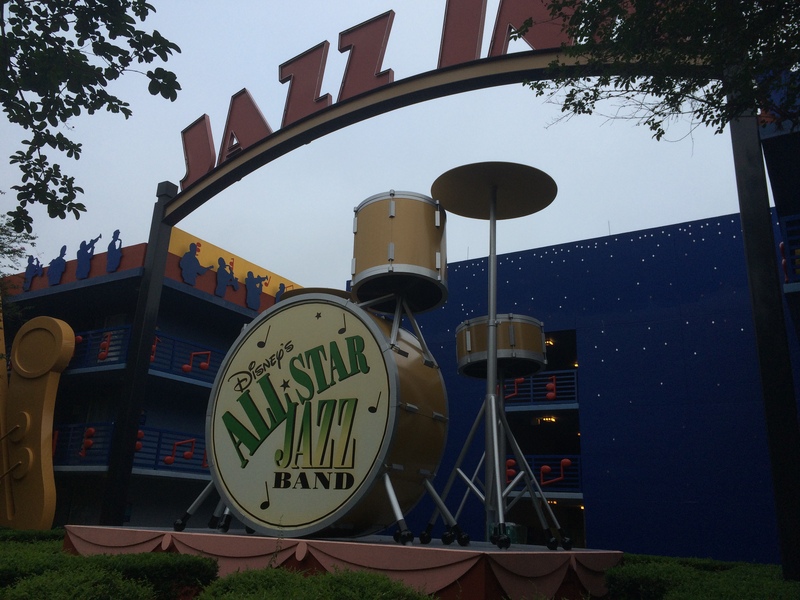 A little past the All Star Music Resort, I saw this on the road! 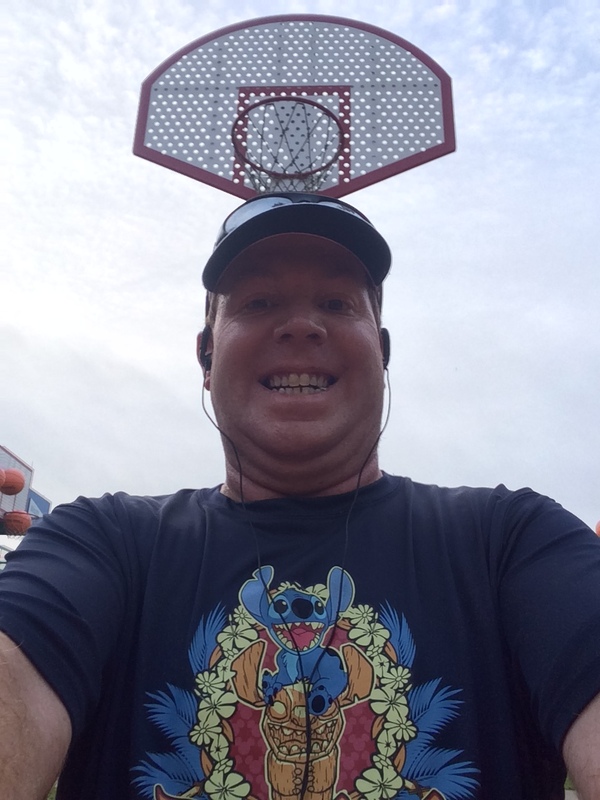 I tell ya…runDisney is everywhere! 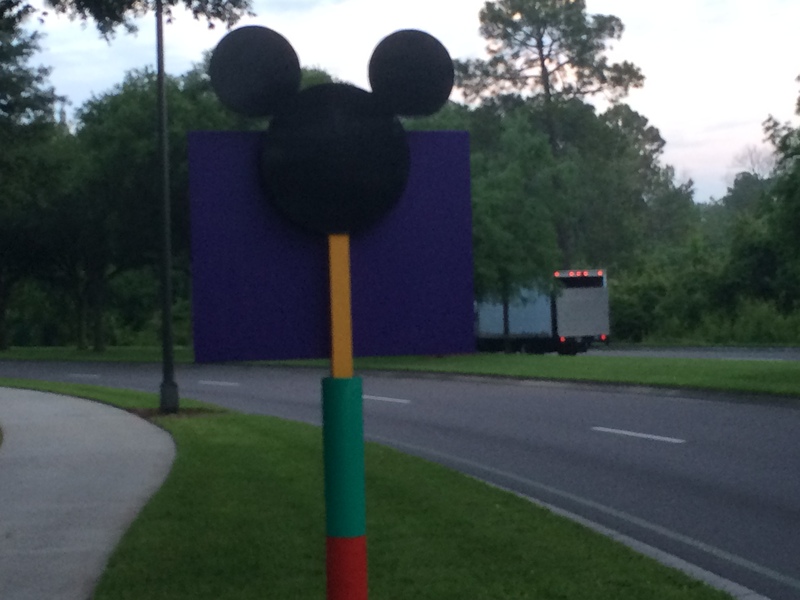 What I’d learn later is that there are three of these runDisney markers. The first is at one end of the path. This was the second one a half mile up the path. The third one was at the end of the mile. 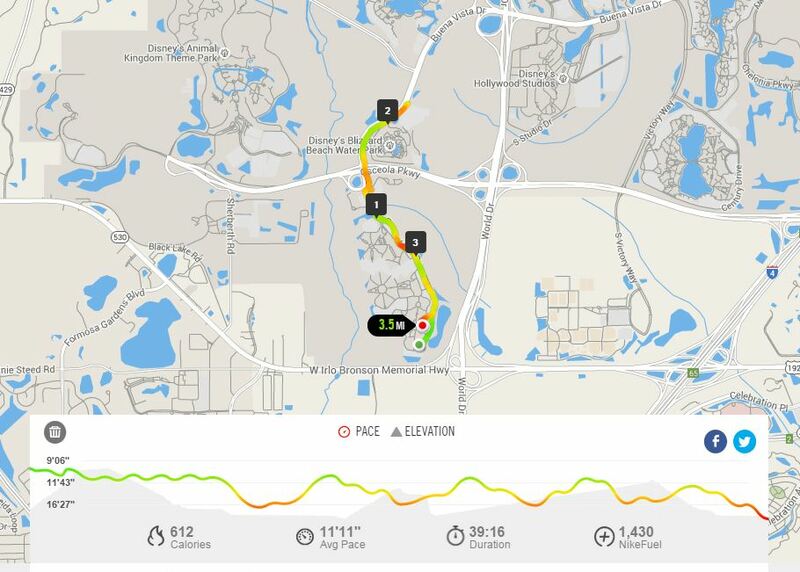 If you ever want to run this path, find the first runDisney marker and go from there. They have each tenth of a mile marked on the sidewalk. So, this would make a great place to do a “Magic Mile.” You don’t even need a GPS watch or running app. 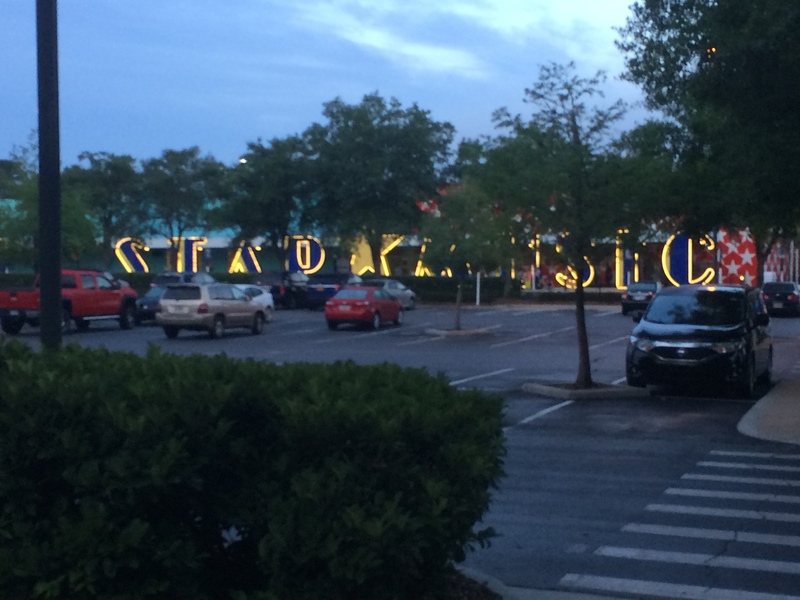 Before I knew it, I was seeing the signs of the All Star Sports Resort. 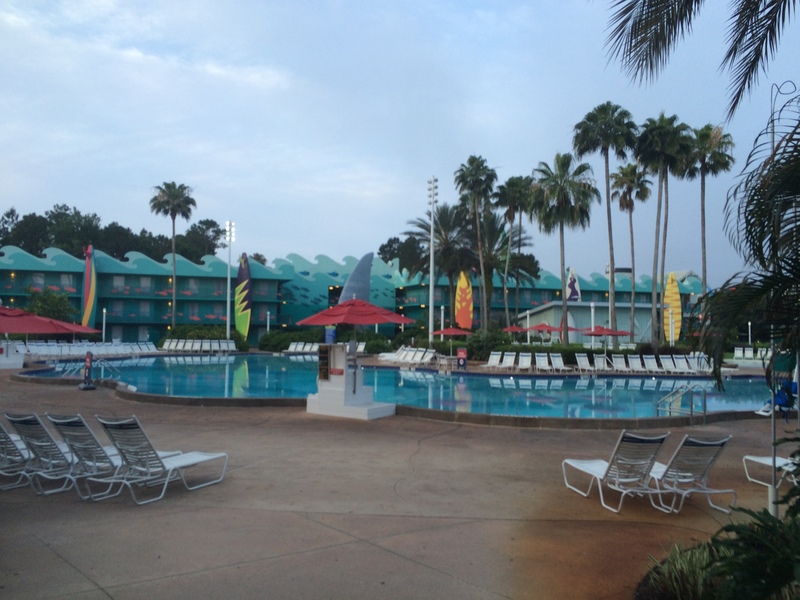 I stayed at this resort for the 2014 Walt Disney Word Marathon! Ah, the memories! 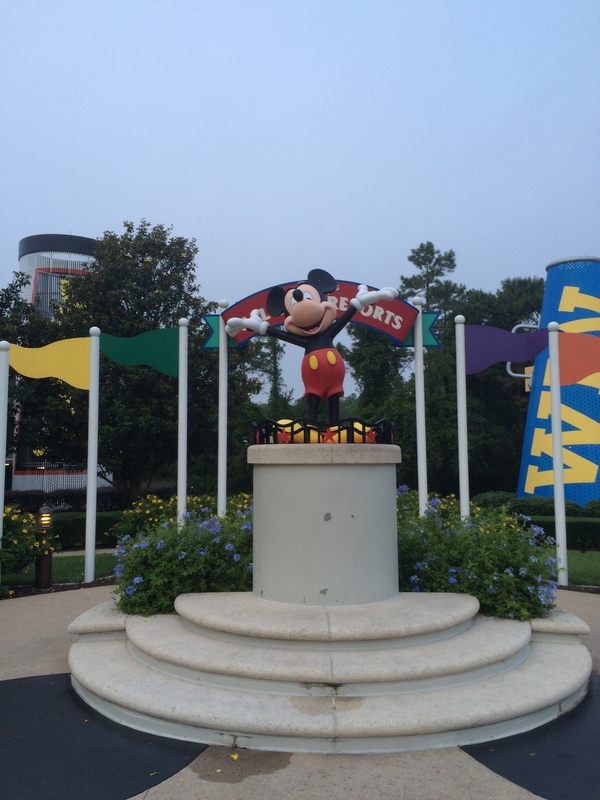 I loved seeing all these Mickey signs along the way! As I passed the entrance to the All Star Sports, I began looking around to see where to go next. I decided to keep going all the way to the McDonald’s. 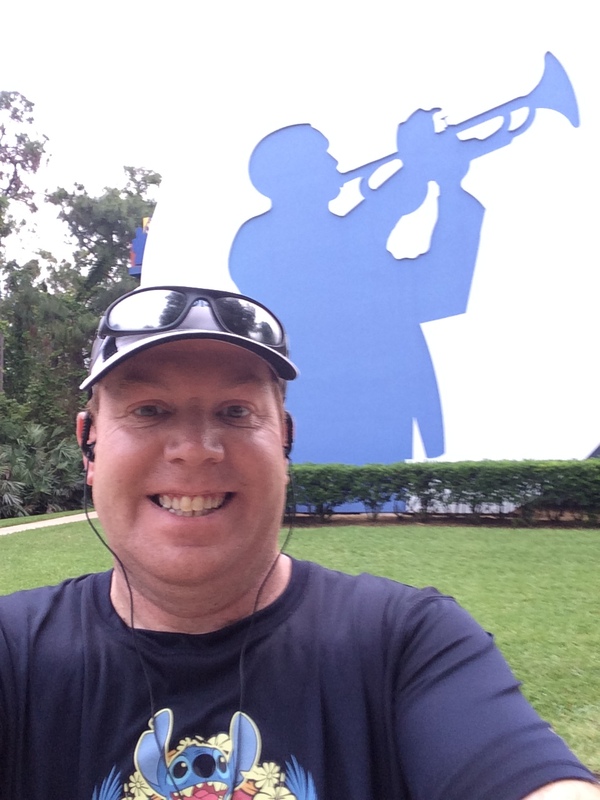 Along the way, I found the end of the 1 mile runDisney running path. The first mile went as well as I usually have. It was finished under 11 minutes. So, I was feeling really good. 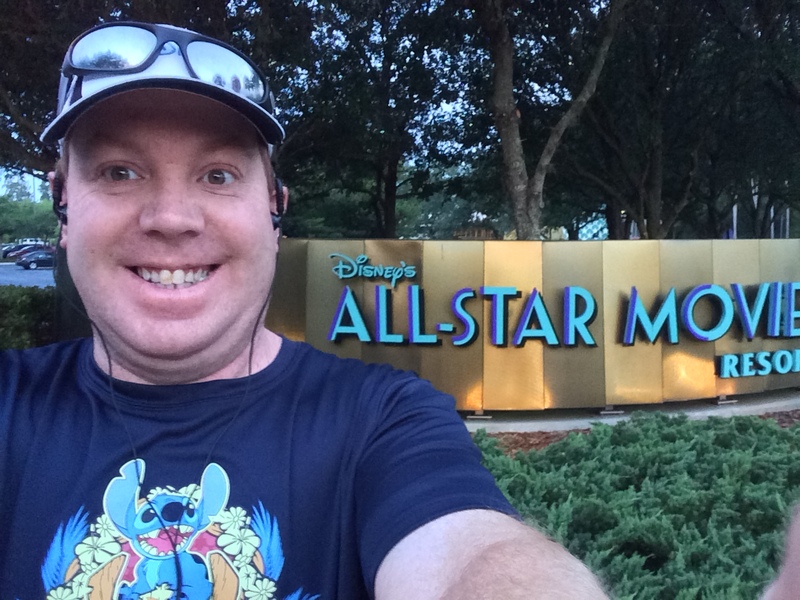 As I was trying to make my 3 miles, I decided it would be fun to run through the various All Star Resorts. 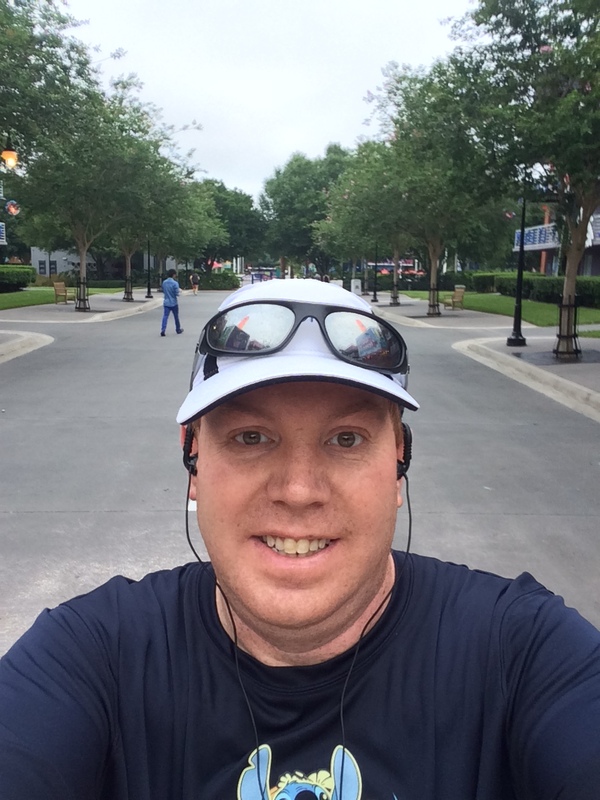 As I made my way through the first mile, I realized that what I thought I could run before arriving at Walt Disney World wouldn’t work. So, I headed into the resorts. Up first was the All Star Sports. Since I had stayed there for the marathon weekend, I knew they had this football field. So, I had to run up and back! Come on now. How much fun was this?! Of course, it’s not a real football field. However, I had so much fun running on it! At the end of the football field, I came to the baseball wing. The whole wing is set up as a baseball stadium with a swimming pool in the shape of a baseball diamond. I briefly toyed with the idea of running the outside of the diamond to run the bases. 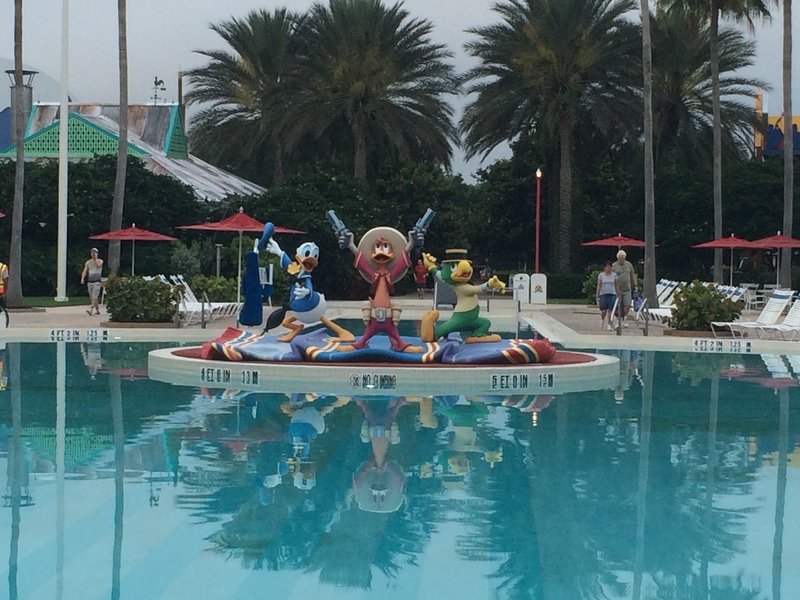 However, since I wasn’t a guest of this resort, I opted to just get this picture. I ran back through the football field and headed towards the basketball wing. Now, they don’t have a full basketball court…just a half court. So, I ran to the middle and stopped for this picture on the way back out. On the way out of the basketball wing, I saw this on the way to the tennis court. When I stayed here, I didn’t remember seeing this. New things! The last wing to run through was the tennis wing. They had this fun tennis court set up. 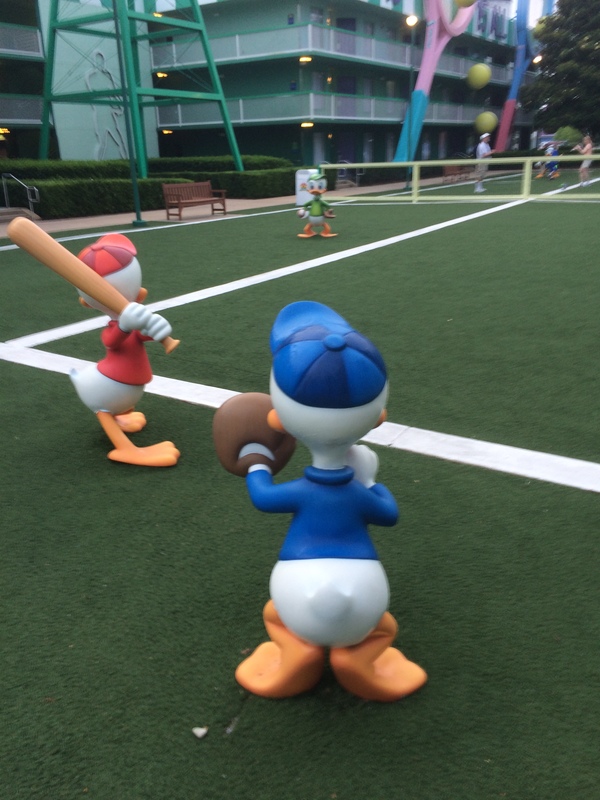 I think Donald’s nephews were playing on the wrong field! 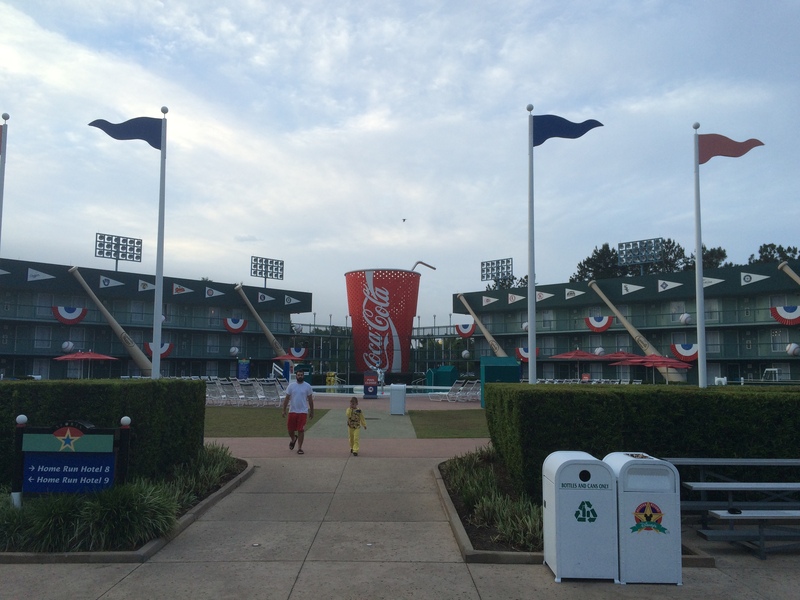 Once I got through the tennis wing, it was time to explore the All Star Music Resort. On the way over to the movies, I found this! 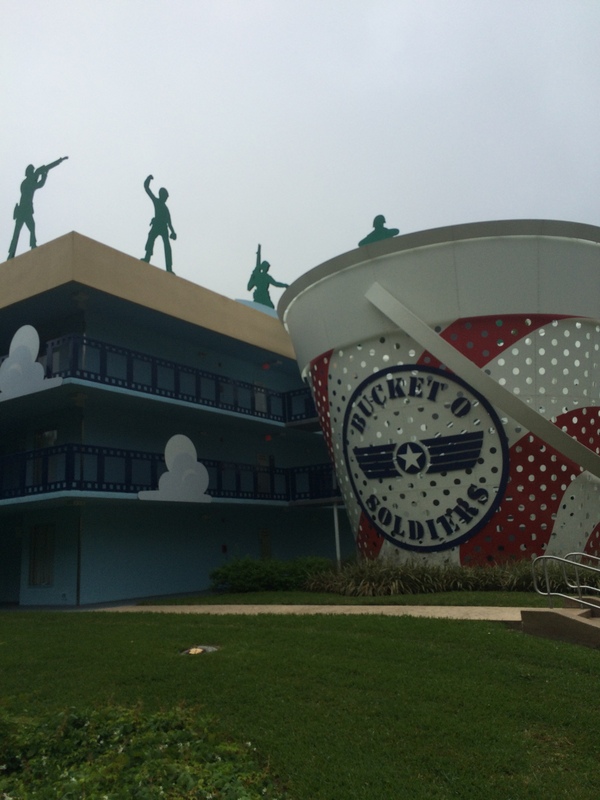 I entered the All Star Music Resort somewhere around the end of the 2nd mile. My time has slowed a little because I was having too much fun snapping pictures. Also, I needed to take a quick stop at the restroom here. I don’t think my body was liking me for not eating something before running. I love this pool! On the way, I had to stop for this picture. After all, in a previous life, I was a trumpet player. It seemed like a great picture for me! This was part of their Jazz wing. I was in trumpet player heaven! 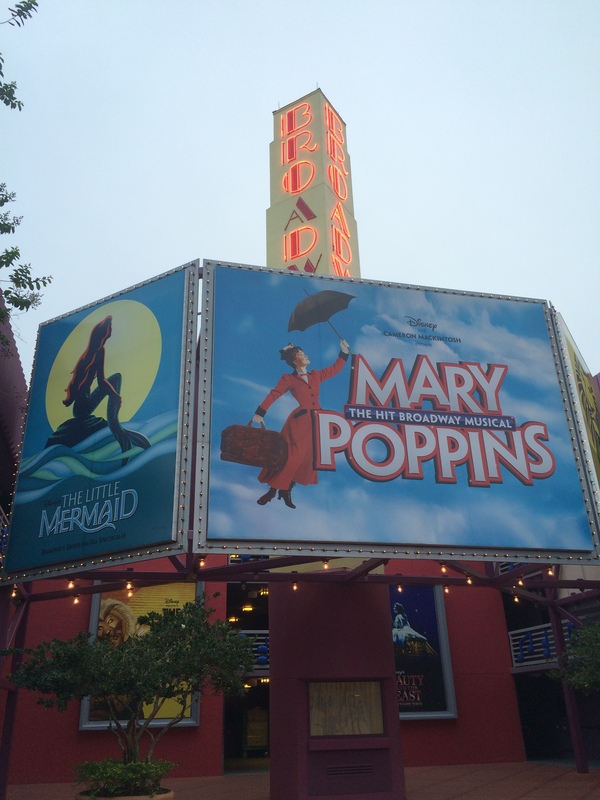 As I made my way around the All Star Music Resort, I saw this Broadway wing. So much fun! I must confess, that I did stop the clock on this wing to grab these pictures. The others were taken on walk breaks. Can you blame me? This wing is too much fun! Goofy was busy getting the tickets ready to sell! Not the best picture. However, it was time to get back to running. After all, time was getting away from me. I was having too much fun on a training run! By the time I got back to the All Star Movies, I realized that I didn’t have much more to go in order to finish my 3 miles. 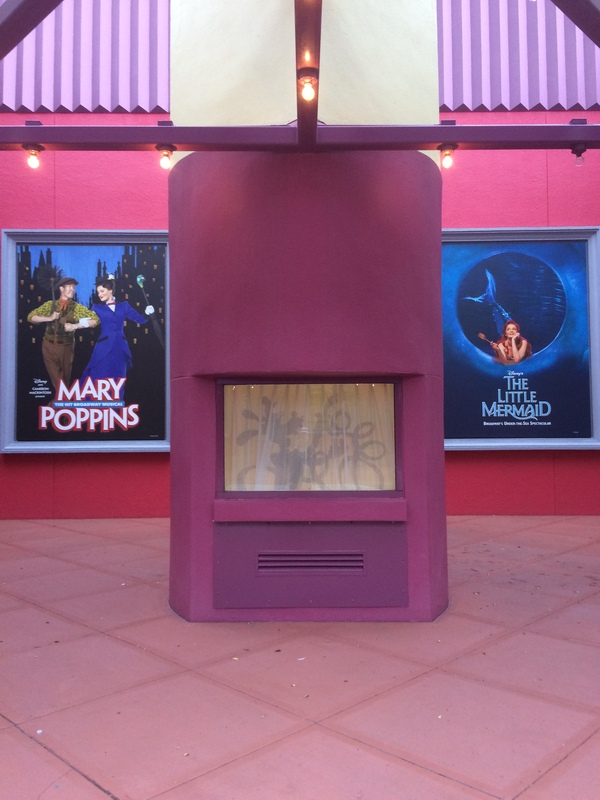 So, I ran the outside of the All Stars Movies. 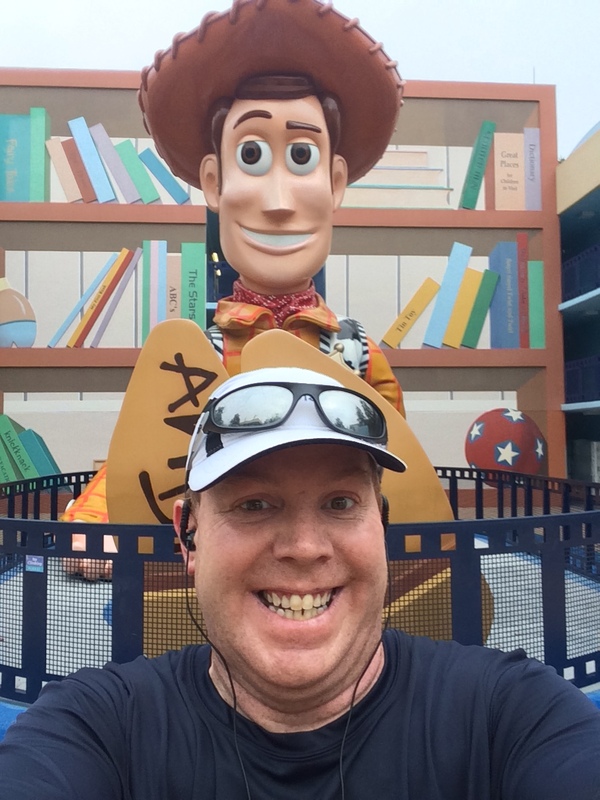 As I neared the end of the third mile, I got to the Toy Story wing! How cool is that?! I literally finished 3 miles right here! This Buzz Lightyear fan was ready to go to infinity and beyond to have timed this so well! Across from Buzz, was Woody. These guys were too cool for words! I finished my run in around 34 minutes, 30 seconds. As I tried to finish my run on the Nike Plus App, everything seemed to freeze on me. The biggest bummer of the day was that this run was not recorded. I would have loved to see the map of where I ran. Unfortunately, it’s all lost. Oh well. Of course, I did have to take a few pics at the end of this first run from my vacation. 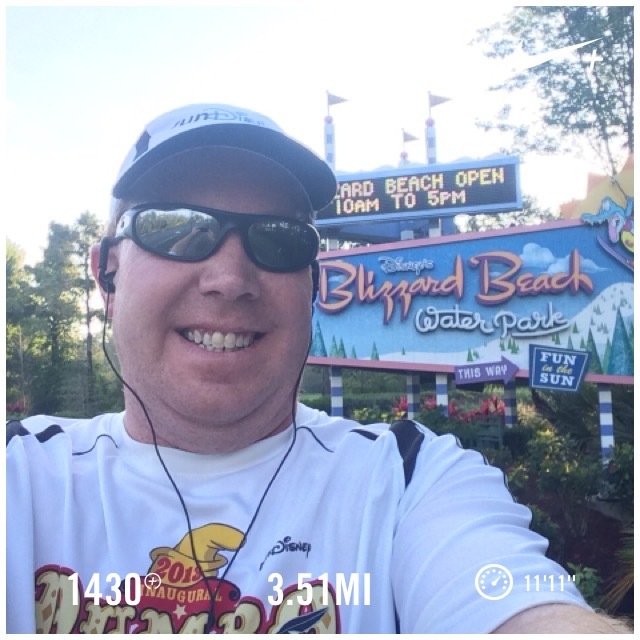 For my second run, I was inspired by riding the bus to the Magic Kingdom. 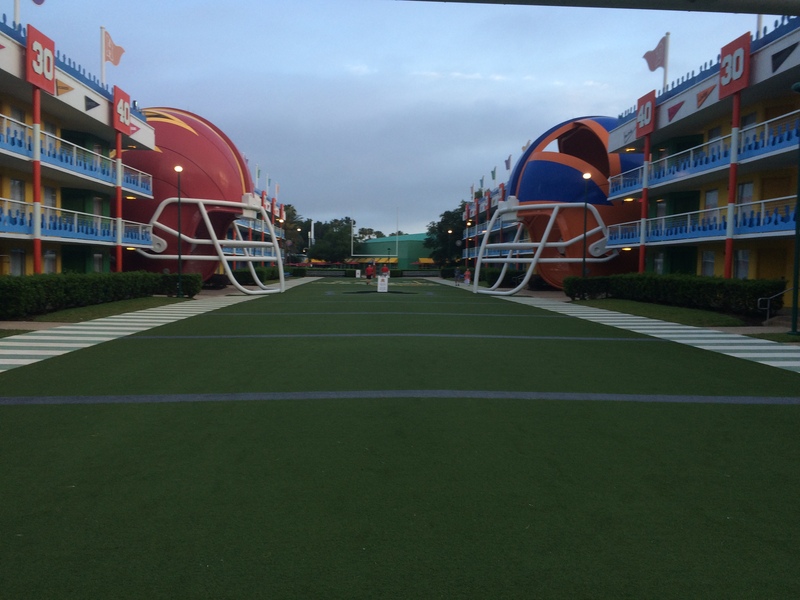 As we made our way from the All Stars Movies Resort to the Magic Kingdom, I watched to see where the sidewalks lead. Although I had no idea how far the sidewalk lead in miles, I saw that I could run all the way to the Coronado Beach Resort if I wanted. 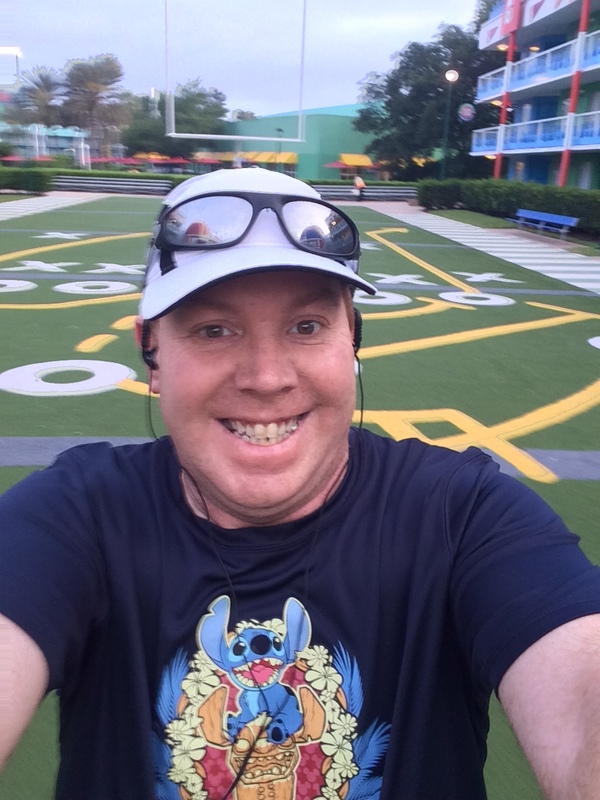 So, for the second run, I found the start of the runDisney path outside the All Stars Movies Resort and began an out and back route. 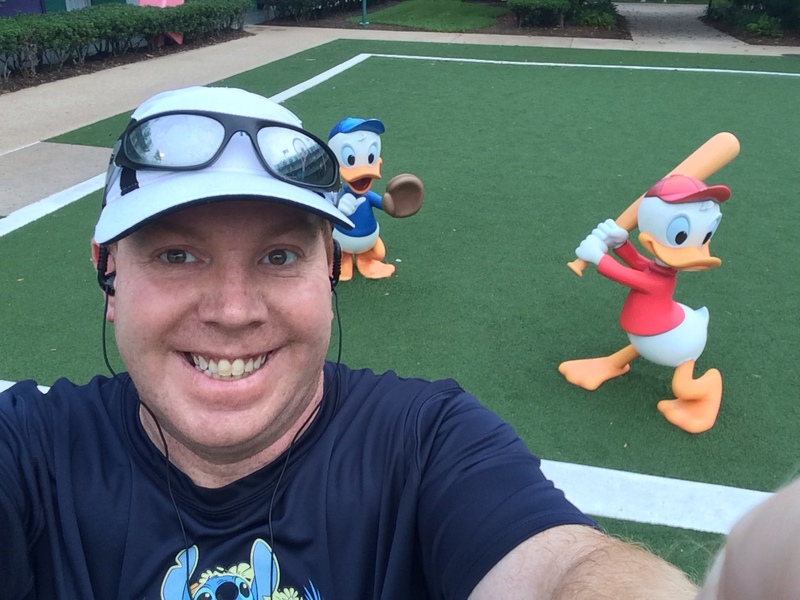 This time, I focused more on the running because I had already taken the pictures on my first time up the runDisney path. This is where I noticed in a big way how much they have done with this path. 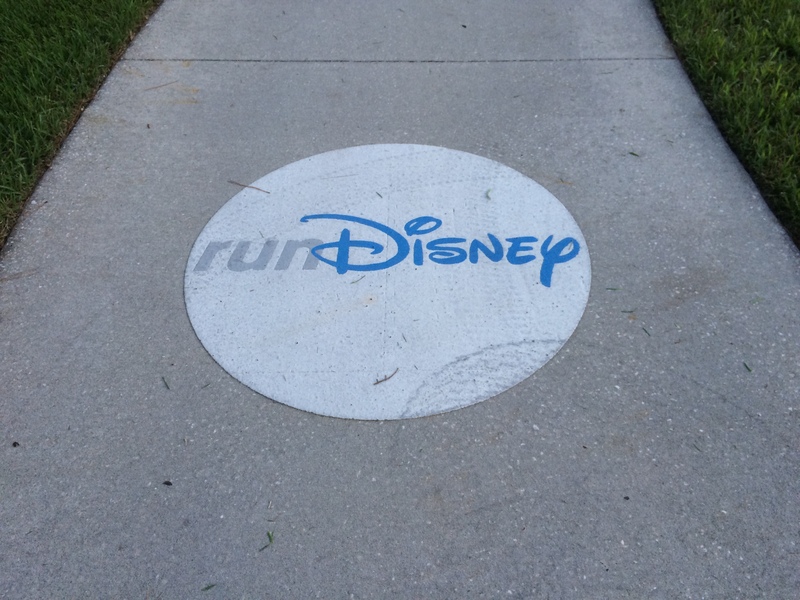 I saw the first runDisney logo and noticed the markings every tenth of a mile along the way. The first mile went about the same as the previous run. I kept it under 11 minutes. 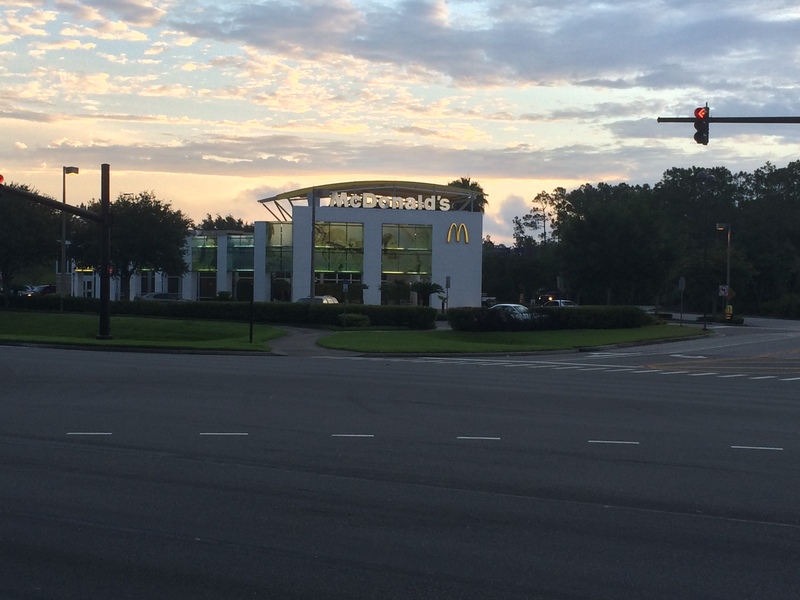 This time, when I got to the McDonalds, I crossed the street and continued along the sidewalk. I was running my 30 second run/1 minute walk and going pretty good until I got to the other side of the overpass. 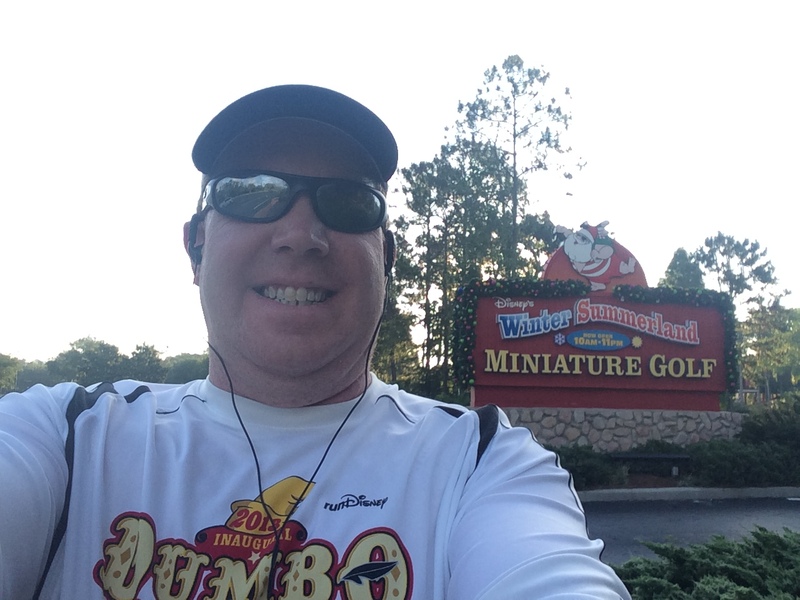 Then, I got to the Winter Summerland Miniature Golf Course. By this time, I was at around a mile and a half. If I turned around, here, it would make my planned 3 miles. However, I knew that Blizzard Beach was not too much further up the road. I started thinking about whether or not I wanted to make it all the way to the Coronado Beach Resort or not. The plan with my group was to head to Disney’s Animal Kingdom on that day. 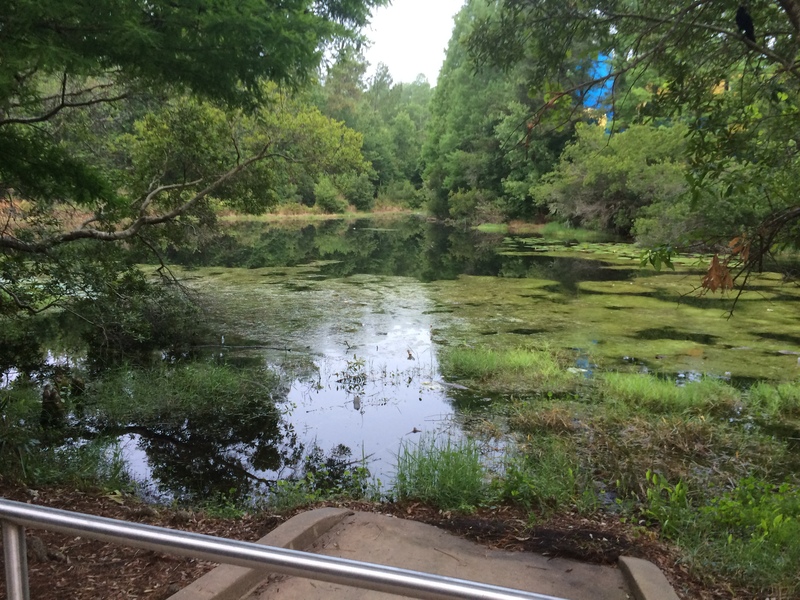 We wanted to get there early enough to see the animals out and about on the Kilimanjaro Safari. 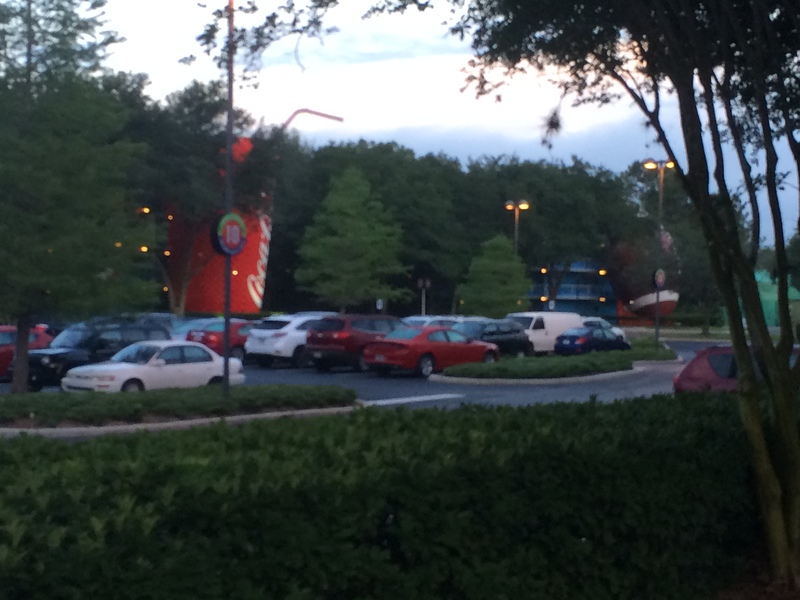 So, I decided to just make it to the entrance for Blizzard Beach and turn around. By this point, I was at 1.77 miles. So, that meant I’d get 3.5 miles in total. As you might imagine, indecisiveness and new scenery slowed me a little in the second mile. On the way back, I was taking in the beauty of all this greenery! I did stop to get this quick picture of the castle. 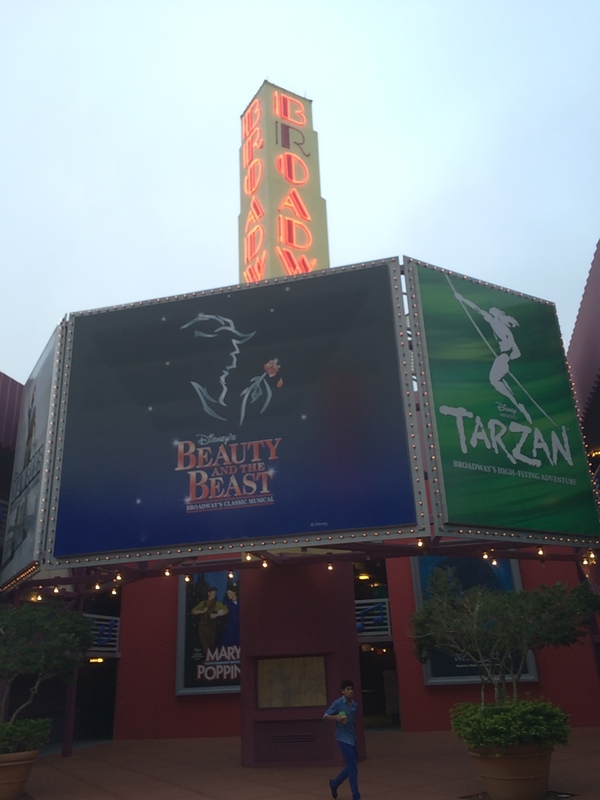 It’s not Cinderella’s Castle or Sleeping Beauty’s Castle, but it was a fun sight on my run. The second mile was finished in 11 minutes, 22 seconds. I picked up the pace to finish the run. My third mile was 11 minutes, 10 seconds. 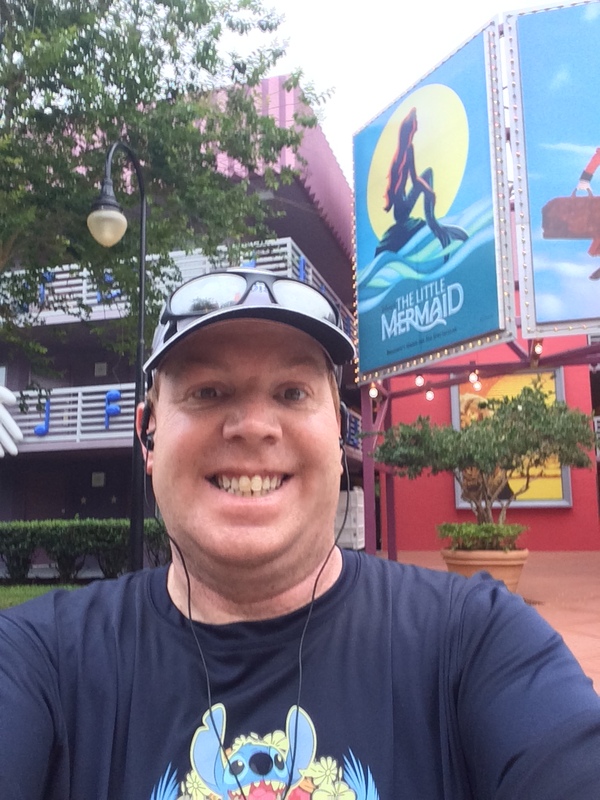 By the time I got back to the runDisney path at the All Stars Resorts, I knew I wanted to pick up the pace so we could head off to Disney’s Animal Kingdom. The finish time was 39 minutes, 16 seconds. I’ve been slower and I’ve been faster. However, I really enjoyed this run as well. It was different from the first run I talked about in this post. This time, I was more focused on the running. I was also more tired. By the time I got to my second run, I had finished 2 days of theme park fun. So, I felt a little more tired. At the end of this second run, I felt soooooooo amazing and proud of myself for getting 2 training runs in for the trip. 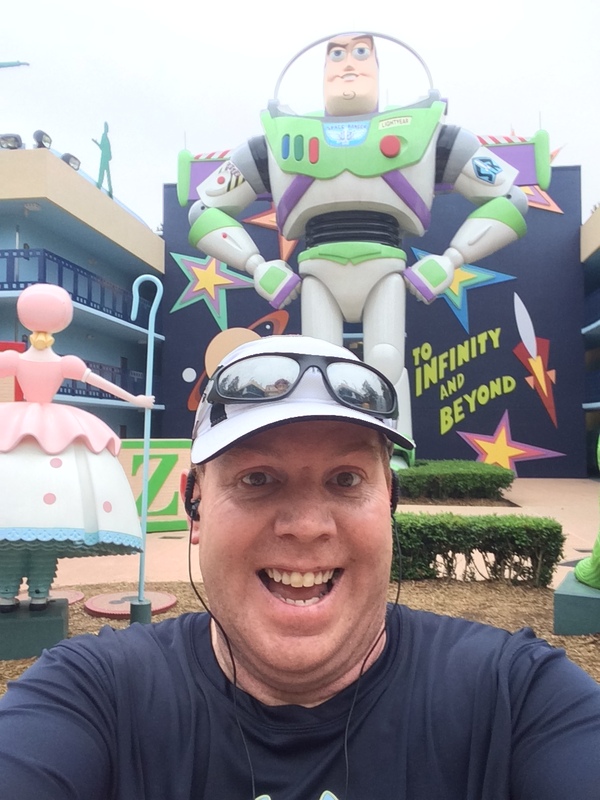 If you ever do plan on running while at Walt Disney World on vacation, you need to make it a priority. Sacrifices need to be made. You can’t stay to close out parks on the night before you want to run. However, it is so worth it! 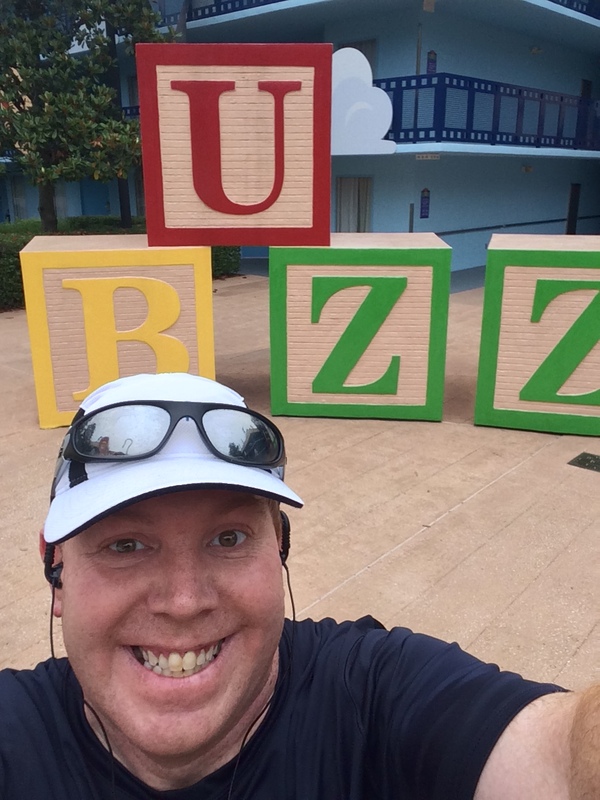 I loved running at Walt Disney World. Next time, I’ll have to explore some other running paths! LOL! We have done the all star area run as a shake out before. OMG the humidity at 7pm was killer. I suffered more through that short run than I did at any race I have ever done. We still laugh about it! I must have been lucky. It it was humid, I didn’t notice. It was nice to run in the cool of the morning! I have had the experience here in California of trying to run in high humidity. You might laugh, but it’s true. That first mile was crazy hard. So, I totally get how hard it can be. Maybe next time, you won’t be there when the humidity is crazy and you’ll get run the All Star Area again. I had lots of fun! 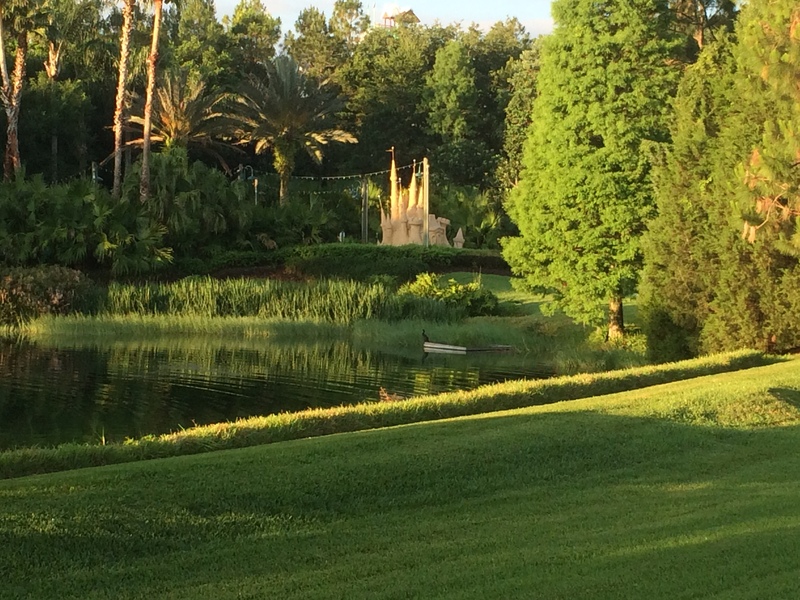 I think you need to find the time for just one run along a path at WDW on your upcoming trip! The paths aren’t terribly long. So, even if it’s just for fun, you should get out and run a mile or so. Of course you don’t have to. I know how much I liked adding the training runs to my trip. So, I think it would be worth it. I’m not sure. I ended up running the path just as the sun was rising. Sorry I can’t be much help.